These are fun treats for any baby shower. 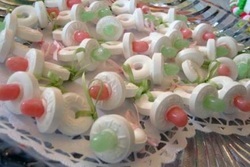 I find that these cute treats are a favorite at every baby shower and the guest absolutely love them. They can be made with minty or fruity candies with a color to match your theme. Popcorn services- hourly machine rentals with an attendant to run it. Rates are based on type of service, date, and supplies needed. Popcorn comes in many flavors including fruity ones. 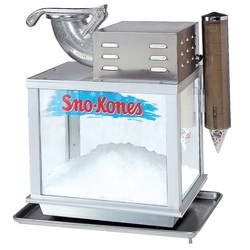 Snow cone service- hourly machine rentals with an attendant to run it. Rates are based on type of service, date, and supplies needed. For the past few years I have been a stay at home mom of 5. I have a passion for parties and entertaining. I enjoy making and decorating cakes and other sweets and love the creativity that I put into my cakes. I offer great products at a fair price. Besides cakes I can make chocolate covered treats, candy pacifiers, pies, and have a commercial snow cone and pop corn popper available for parties. I am a dreamer and I am making my dreams come true one by one. I have always dreamed of being in business for myself and have named that dream after my daughter Zooey. Below you will find a portfolio of some of my cakes and other items that I have done and let other friends and family know about me.